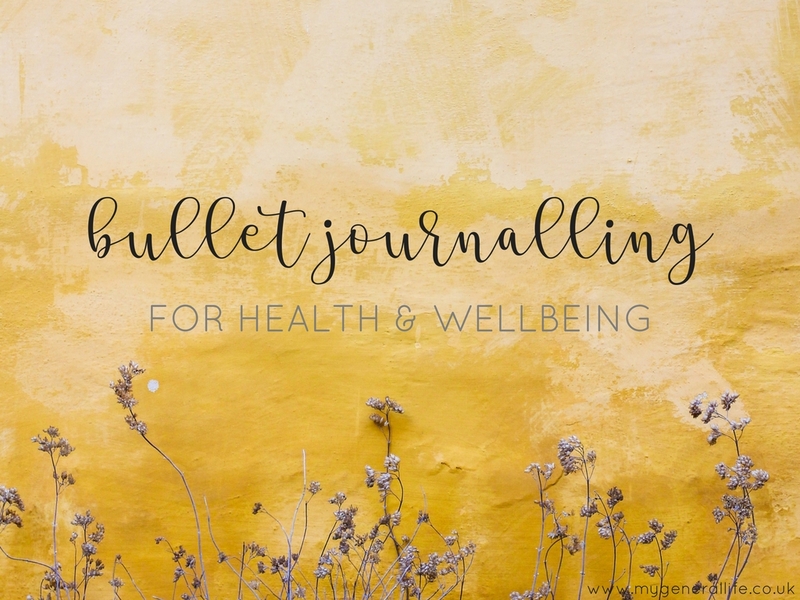 Bullet Journalling for Health & Wellbeing. If you follow me on Instagram, then you may have noticed that I'm rather partial to bullet journalling. 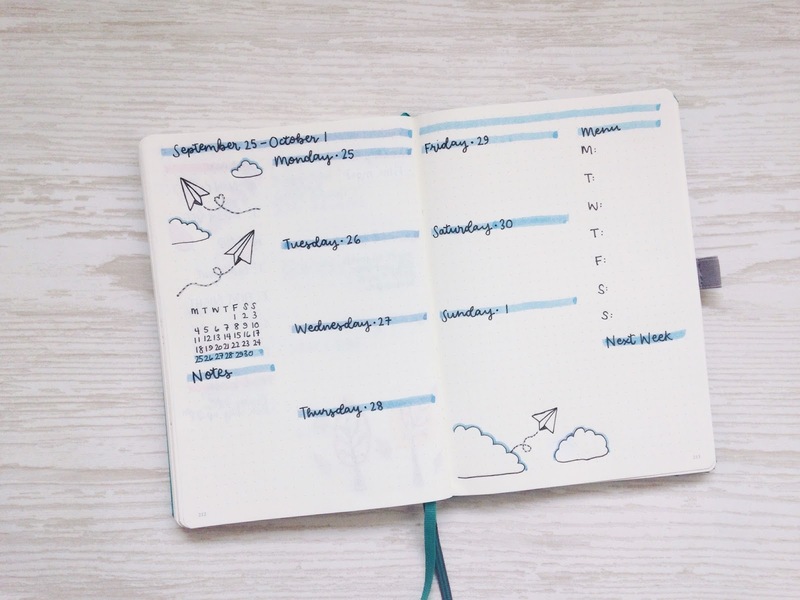 If you're new to bullet journalling I have written a couple of posts on it in the past (although these are super old and I'm in the process of updating them), but to get you up to speed, you can head here to see how to get started. Anyway, one thing that I love about the flexibility of a bullet journal is that you can use it to keep track of whatever you want. It's your journal and is set up however you want it to be, which gives you the freedom to use it in whatever way brings value or meaning into your life. For that reason, I think bullet journalling offers opportunity to work alongside various health and wellbeing focused practices. If you're trying to work new activities into your daily and weekly habits or are keen to see how often you're managing to engage in health and wellbeing promoting activities then habit trackers are a great place to start. They're totally flexible and you can keep track of as many or as little habits as you like. I personally find having a visual list of things that I intend to engage in can encourage me to do them that little bit more (although this doesn't always work). I feel it offers an opportunity to keep yourself accountable, but also to be honest with yourself in relation to how often you actually participate in something. Plus if you want to get all fancy, you can seriously jazz them up by making pretty patterns within your tracker (this is clearly for people like me who have far too much time on their hands!). I have a whole board dedicated to habit trackers over on my Pinterest which you can peruse for some inspiration! For me, being aware of my mood and emotions is an important part of practising self care and compassion. Mood trackers allow you to keep a log of how you were feeling on a particular day which might then allow you to make links with how you feel and what you do (particularly if you're habit tracking alongside this). There are lots of different, creative ways to track your moods, ranging from a simple chart to prettier geometric designs to the slightly more complex but beautiful mood mandala. One thing that has been shown to help in improving wellbeing and quality of life is practising gratitude. 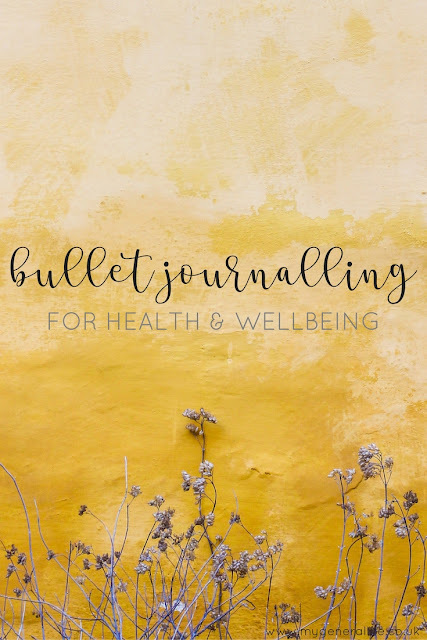 The bullet journal allows you to capture this in visual form in a variety of ways, for example through pictures, collecting mementos and written daily gratitude lists. I personally like to try to write a line or two a day of the things I'm grateful for. I find this a very grounding task that encourages me to reflect on the positives in my day, even if the day itself hasn't been the best. 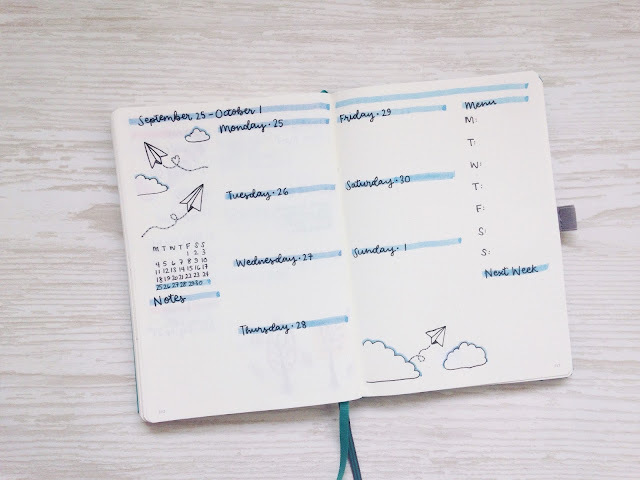 If you're trying to make more positive food choices as part of improving your health and wellbeing, then your bullet journal can be used to either plan meals or track what you're eating and drinking. This doesn't necessarily have to be a separate tracker, and could easily be worked into your habit tracker or daily/weekly spreads. I personally work a menu into my weekly spreads (although admittedly this is more for organisational/preventing food waste purposes), alongside logging my water intake on my habit tracker. Bullet journals are a great way to let your creativity flow. It's a space to create your own rules and try new things. We all saw the huge boom in the use of colouring books for promoting mindfulness and wellbeing, well a bullet journal can be your own personal colouring book, but you create the designs too. Engaging in creative activity has been linked to improved problem solving and coping skills. For me a bullet journal is a perfect blank slate, and if you don't like something, then you just do it different next time - it's no biggie. 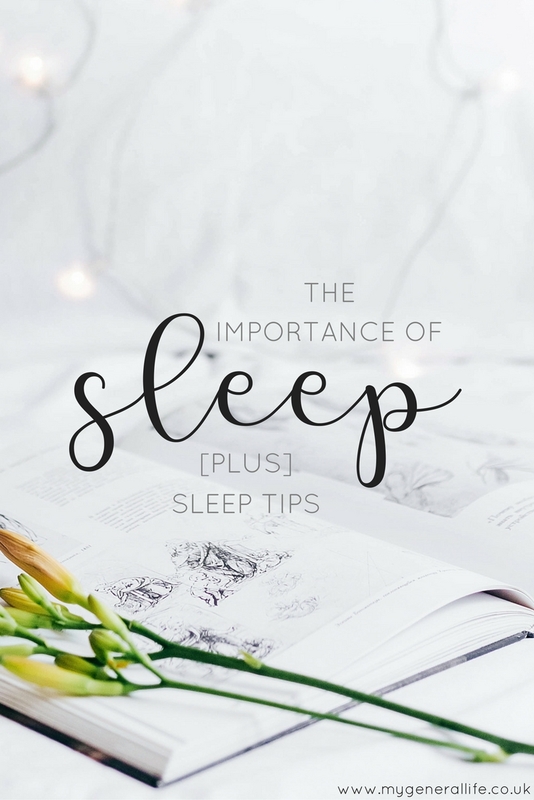 The Importance of Sleep [PLUS] Sleep Tips ft. Emma*. Sleep. I'm sure many of us will hold our hands up right now and say we don't get enough of it. I know I don't a large proportion of the time. I think it's a culmination of modern life, constant pressures to be connected and this need to be killing it/bossing it/winning at life at all times. Anyway, one of my goals for the 30 Days of Self Care that I ran in September was around making sleep more of a priority and trying to ensure that I not only got enough sleep, but that it was good quality sleep too. There's a plethora of research into sleep and the impact that poor sleep can have on our ability to function alongside on our overall health and wellbeing. Research shows that sleep deprivation negatively impacts cognitive functioning (ability to concentrate, problem solve etc), motor functioning and mood. It can also increase the experience of chronic pain, increase risk-taking behaviour and reduce the ability to self-regulate and control your emotions. As well as this, sleep deprivation can also increase the risk of developing chronic conditions such as cardiovascular disease, cancer and depression. So what happens when we sleep that makes it so vital to our day to day functioning? Well, considering we spend a third of our lives asleep, the reason why we sleep is still somewhat of a mystery in many ways. Some ideas of why we sleep are around restoration and repair, memory consolidation and an opportunity for complex problem solving and creativity. I found this TED Talk on sleep rather interesting as it discusses that sleep is an opportunity for the brain to clear out all of the waste products produced throughout the day. I think sleep has almost become a bit of a dirty word in modern life. In many ways it's become a competition around who can function on the least sleep, almost like a badge of honour. This is a bit of a warped way of thinking considering how integral sleep is for positive overall wellbeing. So what can we do to promote sleep as an integral part of our daily life? Phrases like "I'll sleep when I'm dead" are really not that helpful. Yes, we should be making the most of life, but personally I know I can't do that in the way that I want to unless I'm feeling good. And I'll tell you what definitely doesn't make me feel good. Lack of sleep. 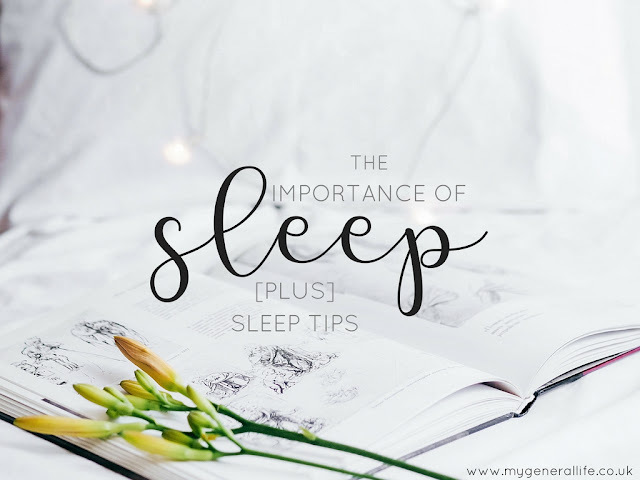 I really feel that if you want to take care of your health and wellbeing AND live your best life then you need to be making sleep more of a priority. That's doesn't mean that you can't go out and have fun at night, but it's about being conscious of the impact this will have on your sleep, because that will ultimately have some form of impact in the days that follow, particularly if you're someone who consistently doesn't get enough sleep. This might mean having to be really strict with yourself. You know when you go on those Netflix binges and just have to watch one more episode of Gilmore Girls (I'm pointing the finger at myself here, but I'm sure you can relate), that is the time to intervene. Gilmore Girls will still be there tomorrow, and think of how much more you'll enjoy it if you're feeling well rested, alert and rejuvenated. Humans are creatures of habit and our bodies use our regular routines in order to go about every day bodily functions. For example, do you find that you wake up early even on your day off? That's because your body doesn't know it's your day of and it's in the habit of stirring at a particular time in order to start the day. The same goes with night time, if you consistently go to bed at the same time, your body starts to go with this and it causes you to slow down and feel more relaxed and tired around your usual bedtime. So how do you go about establishing a positive night time routine? Well the key is consistency. It might feel unnatural and a bit of an effort at first, but the wonderful thing about habits is that they soon become almost like second nature and require minimal effort on your part to go about them. Your night time routine should include activities that promote good sleep, such as relaxation, spending time in a darker space, putting down Instagram, that kind of thing. Try to make it something that's achievable and allows you to engage in activities that you get some enjoyment out of too. There's been lots of discussion and research around the impact of technology such as phones, tablets and laptops on our ability to drift off to sleep. It's thought that the light emitted by these devices reduces the release of melatonin, a hormone that helps control your sleep cycle. They also increase alertness, which let's be honest, isn't particularly productive when you want to be switching off. As much as being on your phone or tablet can be a time filler (I'm hugely guilty of this, particularly at night), are there activities that you could choose to engage in that would be more helpful? For example reading a book (although be careful with eReaders that emit light as these can have similar effects to mobile devices), engaging in a relaxation technique, giving yourself a hand or foot massage, journalling or taking a warm bath or shower. Another habit to switch might be swapping your evening cup of tea or coffee for a caffeine free alternative. Caffeine affects people differently and I'm sure there are people who can't drink tea or coffee past a certain time, and there are others who could drink an high caffeine energy drink and still sleep (I'm in the latter category personally). But in the interest of promoting good sleep and healthy habits, there's no harm in switching to a caffeine free hot drink as this can then become part of your sleep promoting routine - my favourite is Snore & Peace from Clipper Teas. Do what you can within the limits of what you're able to control in order to create an environment that's conducive to sleep. That could be about the physical aspects of your room, like your bed, alongside the sensory aspects of your room, such as lighting, noise and scents. For me, a productive sleep environment is about gentle lighting in the run up to bedtime, soft, cosy bedding, and a comfy mattress. Emma* very kindly sent me one of their mattresses to try out and I have to say, it's completely changed my sleep environment for the better. The mattress itself is made up of different layers of materials including cold foam, memory foam, pocket springs and Airgocell® foam, which all layer together to create an adaptable sleeping surface that offers comfort and support. Honestly, it's how I imagine sleeping on a cloud would feel like. Since switching to the Emma mattress I've not once woken up with a sore back (something that happened on a regular basis previously) and although the mattress is soft, I can feel it supporting me in all the right places. The only real downside that I've found is that is that it's harder to get out of bed once I'm in it because I'm so damn comfortable. Coupled with my cosy duvet it makes for one seriously relaxing space to sleep. The Emma mattress comes vacuum packed in a box that can be unwrapped and on your bed within just a few minutes. It was actually far easier getting my new Emma mattress in the house and on the bed than it was removing my old conventional mattress. What's even better is that Emma offers you a 100 night trial of your mattress, and if after 100 nights you find that it's not for you, you can send it back free of charge for a full refund. For me, this is the best test too see if the mattress is going to help enhance your sleep environment. Because let's be honest, you can't really get a feel for how a mattress is going to impact your sleep whilst lying on it for 5 minutes in a brightly lit showroom. You need to be able to actually sleep on it, in your own space, surrounded by the other aspects of your bedroom environment in order to see if it's going to make a positive overall difference. *these products were very kindly sent to me for review and promotional purposes. All thoughts are my own. 5 Inspiring Ted Talks for Wellbeing. 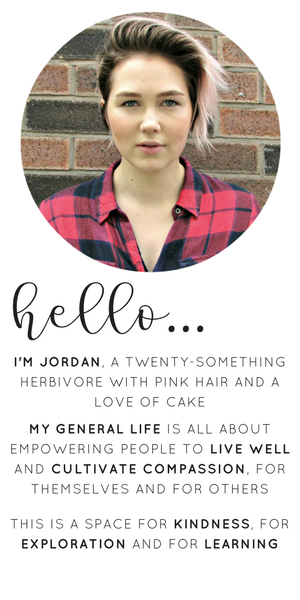 Linking Veganism & Sustainable Living. Curried Cauliflower & Pepper Soup [VEGAN]. 30 Days of Self Care - Round Up.